(1911-03-16)March 16, 1911Expression error: Unrecognized word "march". 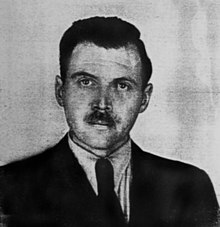 Josef Mengele (March 16, 1911 – February 7, 1979) was a German SS officer and a physician in the Nazi concentration camp Auschwitz. During the first years of World War II Mengele served as a medical officer in the Waffen-SS. After being wounded and recovered in 1942, he went working at the Race and Resettlement Office in Berlin. In 1943 he volunteered for concentration camp Auschwitz. He conducted medical experiments on the people in the camps. Many people died as a consequence of these experiments. The experiments included freezing and placing subjects under heat lamps. Mengele was also known for his studies and fascination with twins. Mengele was known as the Angel of Death. After the war, he first hid in Germany, then escaped and lived in South America, until he drowned in Brazil. Mengele wrote a thesis, which he finished in 1936. His advisor was Theodor Mollison. His assumption was that is was possible to determine the race of a human being by looking at the jawbone. He wrote another thesis, in a related area in 1938. In 1960 and 1961, his title was revoked, because of the crimes he had committed in Auschwitz. This page was last changed on 7 February 2019, at 19:22.